Unique and adorable holiday Reindeer displays from free shipping pallets! Using wood from recycled pallets just makes sense...not only do you save money making these fun displays but you also help the environment by saving trees and keeping used pallets out of landfills. 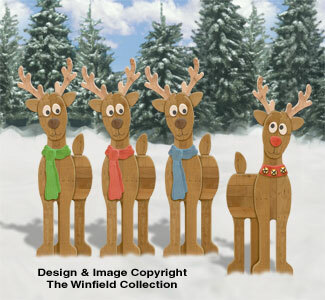 Make the multi-layered versions of our salvaged wood Reindeer (shown) or make the self-standing 3D versions. Individualize your Reindeer by adding colorful wood scarves or belled collars, varying the body length, tilting the heads or rotating the eyes. Our plans include full-size patterns and step-by-step instructions to ensure your success making these fun projects.